Last week we saw an awesome listing. 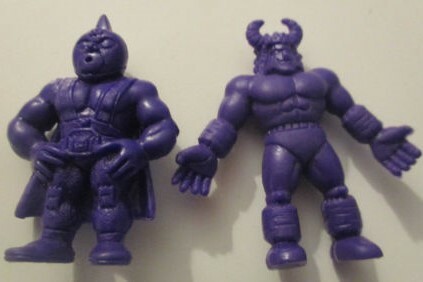 It was a Class A Purple #1 and #93 figure that started at $0.99. The loop needed to be closed. What was the final price? $72.88. I think that’s less than I spent on a Purple #1…or #2. I can’t remember. I’m super tired and don’t have the energy to look. 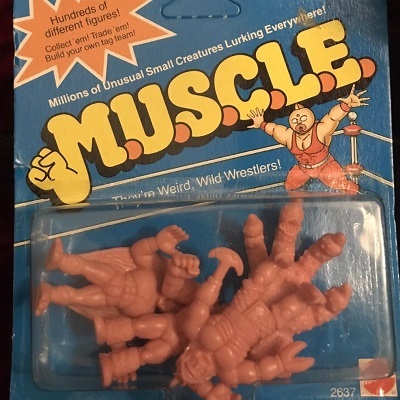 Either way, I think this is the greatest news in a long, long time for M.U.S.C.L.E. collectors. We might FINALLY be at the point where MOST Master Set collectors have MOST of the figures they need. That’s a very broad statement, but maybe we’re at the very beginning of it. That tells me the vast majority of figure prices will drop like a meteor from the sky. Admittedly, as that happens, the hyper-focus on the “last few figures” will probably start to intensify. And we’ll see some very specific figures selling for much, much more than people expect. Guess what. I can live with that. Once that “last few” wave crashes, the madness is over. – I liked the clear figure. Is it Exogini? 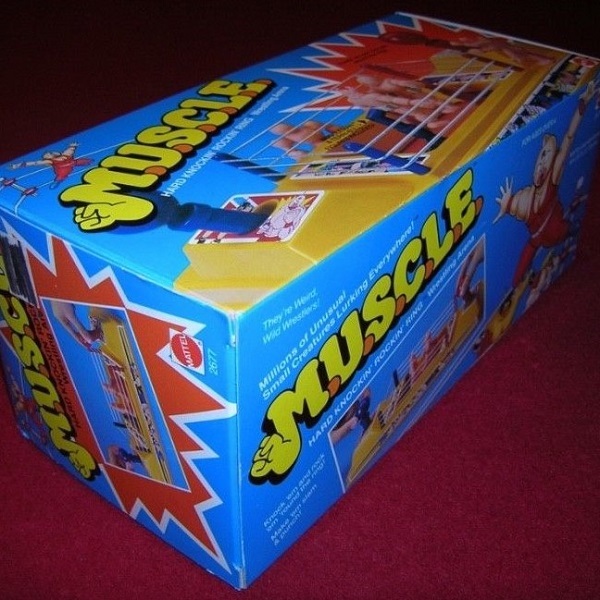 – How long would you keep listing this? – I’ve always said custom stuff would be the last thing I sell. Especially since my taste isn’t going to be someone else’s preference. – I guess this is a good lot? – Worst case of Super7 remorse we’ve seen? – I see Canada and get excited. I should look at the figures first. – Whoa. Did the shipping jump like 200%? 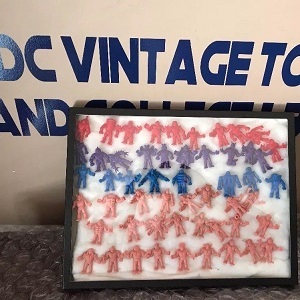 – Nine figure for $40. They lucked out this week. – Guys. 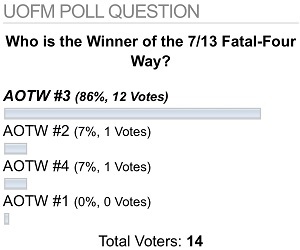 It’s an AOTW Fatal-Four Way Battle of the Champions week. – Damn. Sellers want that AOTW title. – There would have been too many contestants this week. – Let’s just get to the tournament. 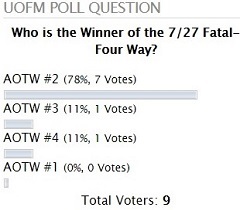 The winners that are entering the 2nd AOTW Fatal-Four Way Battle of the Champions are all powerful champions. Each one won, but most dominated their opposition. Let’s take a look at the four combatants and how they got here. Winner #1 had an interesting field on LRG’s 16th anniversary. They squeaked by on one vote, but don’t underestimate this champion. The Week #2 Winner won by 11 votes. I thought there were some worthy competitors, but I was wrong. This one was born a champion. The field of combatants from Week #3, again, I thought were all very strong. I was wrong. The Week #3 winner crushed their competition by six votes. Finally, we have our winner from last week. The Week #4 Winner, with minimal voting, still smoked the competition. The winner of this match-up will be the second combatant in the AOTW Fatal-Four Way Battle of the Champions Super Match-Up. 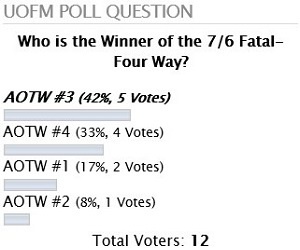 Based on the comment from plasticfiend I thought I would try something new for this 2nd AOTW Fatal-Four Way Battle of the Champions. Voting can take place below, or in it’s normal place in the top right of the website. 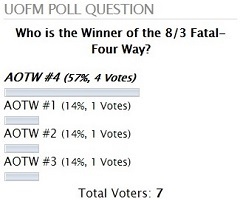 Who is the 2nd AOTW Fatal-Four Way Battle of the Champions Winner? The winner will be the second combatant, and face-off against the $649.95 4-Pack plus two unknown fighters, in the AOTW Fatal-Four Way Battle of the Champions Super Match-Up. Since we’re in the second half of the baseball season, I’ll share one of the funniest baseball gifs I have ever seen. I had to watch it twice before it made me laugh – which I was actually happy about, it made me feel like much less of a creep. This entry was posted on Friday, August 10th, 2018 and is filed under UofM News. You can follow any responses to this entry through RSS 2.0. You can skip to the end and leave a response. Pinging is currently not allowed.